Monday nights on Fox have morphed into quite a night for blanket Muslim-fearers and those who view Chicago as one big crime scene in need of drastic measures from a billionaire businessman. Read into that what you will. Specifically, it’s Chicago’s 13th District for starters. Its cops are undermanned, outgunned and therefore inefficient. Reeves, whose company has set the pace for technological innovation, buys his way into total control of this sub-force by throwing money at the Windy City’s budget shortfall while threatening to fund Mayor Salgado’s (Nestor Serrano) opponents if he doesn’t give the go-ahead. The mayor at first sneers, then capitulates. The swaggering, wisecracking Reeves -- “Long story short, we’re gonna change the world” -- soon has an APB crime alert app in the hands of citizens while also deploying drones and giving the cops souped-up squad cars, futuristic looking uniforms and the latest in sleek weaponry. But in the premiere episode, the crime fighting itself gets bogged down with rote action scenes shot mostly in the dark. Hours two and three, also made available for review, are somewhat better executed. APB further fleshes out the relationship between Reeves and Detective Theresa Murphy (Natalie Martinez), a savvy, opinionated Latina still carrying the surname of her ex-husband. These episodes also mark the welcome addition of Abraham Benrubi (ER) as Pete McCann, a former star wrestler who’s now Reeves’ top hi-tech fine-tuner. The character instantly resonates. Reeves, of course, does a lot of ride-alongs, mainly with the comely Murphy. “We should have some ‘detecting’ music,” he quips at one point. Murphy also has a young son who actually enjoys school and learning. And her mama, during a nicely played dinner-at-home scene, quickly sees a future for them that includes more than police work. So far, though, there are no sparks beyond an improving relationship on the crime-busting front. She learns from him and he from her. Take it from Murphy, “You can’t underestimate the bad guys on this job -- ever.” Got it. 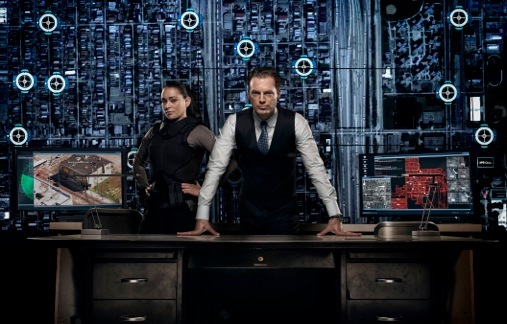 The APB ensemble is rounded out by tradition-minded district captain Ned Conrad (Ernie Hudson); hard-charging police officer Nicholas Brandt (Taylor Handley) and Reeves’ trusty assistant, Ada Hamilton (Caitlin Stasey), who gets an intriguing and apparently ongoing subplot in Episode 3. All three episodes make their principal crimes personal, whether it’s tracking down the killer of Reeves’ best friend, catching a pharmacy store robber responsible for a serious injury to Brandt’s trusty police dog, Zingo; or rounding up the gang that killed Murphy’s mentor. The overall portrayal of Chicago as a crumbling, bad guy-dominated city in need of a savior won’t win any points with the Chamber of Commerce. But DJ POTUS certainly won’t mind the premise and likely will also take a strong liking to the radical islamic terrorist thread running through 24: Legacy. Both series were in development long before the presidential election ended in such stunning fashion. But it now seems as if they were drawn up only yesterday.